There are four stages to the Obama way of government. Stage 1: Ignore the problem - "We're in a recovery." Stage 2: Deny the problem - "The private sector is just fine"
Stage 3: Blame Bush - "I inherited a bad economy." Stage 4: Cry Racism - "It's because he's black." We are now finally reaching the third and fourth stages with Fast and Furious. There is the Blame Bush claim and the racism claims are creeping forth. But what exactly is more racist, killing hundreds of Mexicans or criticizing a black Attorney General? In 1992, Abdul Awkal, a Lebanese Muslim, met up with his wife and her brother at the Family Conciliation Office in the sprawling Lakeside Courthouse. Awkal’s wife had filed for divorce after years of physical abuse and a sexually transmitted disease that she contracted from him. In response, Awkal had bought a gun and threatened to shoot her if she didn’t come back to him. On the day of the shooting, Awkal, who would base his entire twenty year defense on an insanity claim, wrote a check for most of his assets to his brother, and arrived at the courthouse with the stroller, child seat and baby food that he would need once he abducted his daughter. He met up with his wife and her brother inside the courthouse and killed them. Then he tried to use his 15 month old daughter as a human shield before being shot in the back by law enforcement. Awkal told police that he had ordered his brother-in-law to “profess that Allah was the only God.” And he had only killed him after he refused to do so. That's from my article on the latest death penalty case getting an all-out defense from the left. Obama passed his version of the DREAM Act by well... just doing it, and the Republican Party has courageously come out and said, that he didn't follow proper procedure. Romney hasn't said that he would repeal it. Rubio, who is suddenly being touted for the VP spot, released a memoir where he said that he would have come here illegally, and complained that Obama's move prevents a more permanent solution. Apparently the new approach is to attack Obama from the left on immigration. Or just to fumble around and hope somebody else gets asked the question. That one comes from Romney. "Politicization" seems to be the talking point here. The other talking point is "Permanent Solution". But what exactly does any of this mean? Do Republicans genuinely want any variation of this that would be a "Permanent Solution"? Romney said that he would veto the DREAM Act. But he's being deliberately vague on this variation of this, which technically isn't a flip-flop because this doesn't lead to permanent residency. So it's also not Amnesty. But really it's just a two-step process. Instead of going directly to home base, this way there's an intermittent legalization, leading to permanent legalization. And if you get an advanced degree here, we want you to stay here – so we will staple a green card to your diploma. Romney has said this before. It's still dumb. And he's promising his own version of the DREAM Act which will apply to illegal aliens who serve in the military. Most Republicans are following the Bloomberg poll, but earlier DREAM Act polls showed only marginal support for full legalization. Does the lack of full legalization make all the difference or are the results skewed? And again does that matter. You either lead on an issue or you bleat. Leading would mean pointing out the lost jobs created by handing out work permits to illegal aliens like candy. Liberals would have to counter with the usual claims about college job creation to grow the economy and that would shift the center of gravity into an argument about the economic impact of the move. Instead Republicans are debating procedure, which not that much of the public is going to care about. Instead of leading, they're bleating that they didn't get the chance to do a better version of it in Congress. The number of people who are going to be impressed by that argument is tiny. Positions are defined by arguments. If the Republicans don't make a serious argument on a red meat issue, then what are they going to make a serious argument on? Procedure? The Democrats have been allowed to define Obama's DREAM Act as positive and all that the Republicans can do is argue that it's not so positive because procedure wasn't followed. That's Step 3 in how to lose an argument in a public arena. There are no detailed crosstabs on the Selzer poll for Bloomberg, but the 2010 Gallup poll showed similar numbers in some respects. 57 percent of Independents backed the DREAM Act, a number that is up by around 10 percent in the latest poll. Similar numbers of Republicans were for and against. But support among Democrats was weaker with only 66 percent for. The biggest shift in the new poll has been among Democrats, but is that really a shift or is it working class Democrats who don't quite understand the economic impact of it this time around? One final detail from the Gallup poll. Two-thirds of people age 18-34 say they favor the bill, but support drops to 53 percent among those age 35-49, 50 percent among those age 50-64, and down to 43 percent among those age 65 and older. The Bloomberg poll does not provide the age numbers, which would be interesting. But current polls peg 18-34 support for Obama at around the same margin as that. ‎74 percent of all Jewish children in the city are Orthodox, a baby boom that will completely transform the city’s Jewish population. And that means the transformation of the Jewish vote. Within another decade, New York City will have an Orthodox majority; within a generation that majority will be so decisive as to define its political orientation. The end of the New York Jewish liberal is here. The Siena College survey gives us a preview of what the new American Jewish vote will look like by studying the changing Jewish political attitudes of New York City today. 62 percent of New York City Jews believe that America is headed in the wrong direction. 34 percent rate Obama’s job performance as poor, tying for the number that rate him as good, while only 7 percent rate him as excellent. 46 percent would prefer to vote for someone other than Obama. 42 percent have a favorable view of Mitt Romney. 43 percent are planning to vote for Mitt Romney. 48 percent think that Romney would be better at addressing the deficit. 45 percent think that Romney would be better at improving the economy (versus 43 percent for Barack Obama). New York City Jews are suddenly polling as more conservative than Protestants and only moderately more liberal than Catholics. There is no doubt that Obama’s poor performance has played its part, but the most significant element is simple demographics. This is from my piece on The Death of Jewish Liberalism and it contains some very significant numbers. The CIA is helping those cheerful Muslim Brotherhood fellows smuggle heavy weaponry that the Saudis bought for them. Also Syria claims to have shot down a Turkish jet plane. There are probably frantic calls from State to Erdogan begging him not to retaliate, or this will look like a Syrian-Turkish conflict, which it is anyway, as Turkey is a major backer of the Muslim Brotherhood takeover effort of Syria. Of course a skirmish between Syria and Turkey could drag in NATO intervention without the need for more delaying games and covert ops, but it wouldn't be nearly as popular to intervene on behalf of the brutal Turkish regime against the brutal Syrian regime, as it would be to save the "Syrian people". Meanwhile a rebel massacre in Syria is being reported by the media as a "rebel ambush" because terminology is so important. When the Syrian government kills people, it's a massacre. When the rebels kill people, it's an ambush. Under the Senate transportation bill, states would receive additional funds if they outlaw texting from behind the wheel, prohibit drivers under age 18 from using cellphones of any kind while driving and take other actions to combat distracted driving. The bill also would require states to spend a chunk of the money they receive on anti-distracted driving programs, such as beefed-up law enforcement targeting distracted drivers and advertising on the dangers of distracted driving. Her efforts have run into Democratic opposition. "Rapidly growing problems of course quickly become a growing crisis. And once it's a crisis, then it's time to rally the troops and start banning things. And there you have it, it's a growing crisis. Next it becomes a growing epidemic. And then Obama gives a speech explaining that the reason we can't compete with China is because of our distracted drivers and asks Congress to join with him in "investing in America" by funding distracted driving programs. I wrote in detail last week about the Obama Administration's refusal to treat the Islamic Boko Haram's genocidal campaign against Nigerian Christians as terrorism. The U.N. Office of the High Commissioner for Human Rights is, acknowledging Boko Haram's atrocities as crimes against humanity and ethnic cleansing. It had done so as early as the beginning of this year. Boko Haram has still not been placed on the foreign terrorist list, but the State Department finally named its leaders as terrorists. The State Department press release is a testimony to just how fluid the language has become. The Department of State designated Abubakar Shekau, Abubakar Adam Kambar, and Khalid al-Barnawi as Specially Designated Global Terrorists under section 1(b) of Executive Order 13224. Shekau is the most visible leader of the Nigeria-based militant group Jama’atu Ahlis Sunna Lidda’awati Wal-Jihad, commonly referred to as Boko Haram. Khalid al-Barnawi and Abubakar Adam Kambar have ties to Boko Haram and have close links to al-Qa’ida in the Islamic Maghreb, a designated Foreign Terrorist Organization. So Boko Haram is a "militant group", but its leaders are terrorists. It has links to Al-Qaeda, but the group itself only consists of militants, except for its leaders who are actual bona fide SD approved terrorists. The designation under E.O. 13224 blocks all of Shekau’s, Kambar’s and al-Barnawi’s property interests subject to U.S. jurisdiction and prohibits U.S. persons from engaging in transactions with or for the benefit of these individuals. These designations demonstrate the United States’ resolve in diminishing the capacity of Boko Haram to execute violent attacks. The Department of State took these actions in consultation with the Departments of Justice and Treasury. Muslims in the United States are still free to raise money for Boko Haram, so long as they don't benefit the three individual leaders of Boko Haram. And the Obama Administration is not looking to put a stop to that. In unrelated news, the Nigerian police have captured another Boko Haram leader, Habib Bama. Charles Barron, who is running for Congress on a platform of hating everyone, has won the endorsement of David Duke. The only problem is that Charles Barron is black. The impact of the endorsement is low, but if Barron loses, there's potential for a real buddy cop comedy here. If Barron wins, the Democrats will have the first Neo-Nazi endorsed Congressman in office in quite a while. Aside from the Jews thing, Barron talks like he read too much Mein Kampf. Barron said, "Our troops are on the ground, and what we have heard from people in the district has been very [inspiring]... We have built the momentum. We think the whole establishment is scared and afraid [of] what we might represent as an unbiased, unbossed voice [in Congress]." Also he added, tomorrow we take Poland. White Supremacists are accusing David Duke of selling out. But David Duke is just joining the same side as Norman Finkelstein. The two men share a similar attitude on many things, including the Holocaust. The NJDC has finally gotten around to denouncing Barron, though they didn't send it out via their email list. Nor did they put out an actual statement, instead they linked to two outside articles on their blog and voiced agreement with them. That's not what they did when attacking Joe the Plumber. So the NJDC thinks attacking Joe the Plumber is more crucial than denouncing an actual Anti-Semitic candidate running for election in their own party. Also if Barron does win the nomination, how soon will that blog post go down the memory hole? Fast. Which is why the NJDC used a blog post, rather than a statement. The New York Observer has a very simple suggestion how Obama can make a difference. One person could stand in the way of Mr. Barron’s ambitions. President Obama can and should intervene on behalf of Mr. Jeffries. The president doesn’t have to say a word about Mr. Barron, a fellow Democrat, although it would be nice if he called out the councilman for his horrendous rhetoric. A presidential endorsement of Mr. Jeffries certainly would be a blow for the haters, racial arsonists, and refugees from the 1960s who support Mr. Barron’s candidacy. Now let's see if Obama does it. But of course he won't... and the NJDC will have no answer for why Obama failed to denounce the New York City version of Reverend Wright. Anti-Semitism really is a mental illness, whether the carrier of the illness is Jewish or non-Jewish. Take Elisheva Goldberg, a top official at Anti-Orthodox pressure group, Uri L'Tzedek, who also helps run Peter Beinart's failed Israel-bashing Open Zion blog. 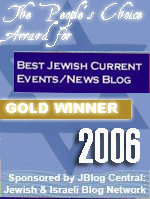 In response to a plan to build an offshore industrial island, Elisheva Goldberg accused Jews of "settling the Mediterranean". In her unhinged rant, Elisheva Goldberg called an island meant to house industrial facilities "Lavish" and an "industrial Disneyland", because when you're describing a place full of factories, the first words that come to mind are "lavish" and "Disneyland". I'm sure it'll be just like a luxury hotel slash Disneyland slash bunch of factories. Uri L'Tzedek's Rosh Beit Medrash is one step away from accusing the Mossad of chipping sharks and putting spiders in bubble gum. Elisheva Goldberg's rant is revealing, not for its accusations that the Jewish State is settling the Med with its lavish Disneyland factories, but for the propaganda momentum that hate groups like hers feed into their narrative. The Jews are evil because they are capitalist swine living it up in luxury. So naturally they're building their lavish gold-plated factories on offshore islands while the poor Hamas terrorists starve. This is what the left needs to believe about Israel to justify its hate. Hatemongers like Elisheva Goldberg put a spin on every story that falls into the old Rich Jews Eat Poor Arab Babies narrative, which is just a mild rehash of Rich Jews Eat German Babies. The Protocols of the Elders of Zion keeps being rewritten all the time, now with the addition of Lavish Disneyland Jew Factory Island. Somewhere under the golden factory floors where the machines are powered by Torah scrolls and the tears of Muslim children, the Elders meet around a poker table and discuss how they're going to refuse to negotiation with the reasonable fair-minded Hamas representatives. Turning back to the news, there are a variety of reactions to the Muslim Brotherhood's ascendancy. In the last few seconds of a CNN interview, Sandmonkey called the Egyptian elections a farce and called on the Obama Administration to back off and accused it of supporting the Muslim Brotherhood. One of his suggestions was that O wanted a Sunni coalition against Iran, but Iran has nothing to do with it. Saudi Arabia does. American foreign policy, as usual, is driven by the Saudis. U.S. Secretary of State Hillary Clinton says Egypt's military must "fulfill its promise" to turn over power to the winner of a presidential runoff vote, as the country's election commission has delayed Thursday's planned announcement of the results. In an interview with journalist Charlie Rose broadcast Wednesday night, Clinton called the military's actions during the past week "clearly troubling." The ruling Supreme Council of the Armed Forces has declared an interim constitution that gives its generals and the courts final say over much domestic and foreign policy, as well as the process to create a new permanent constitution. The military has also restored elements of martial law and dismissed the Islamist-dominated parliament. Clinton said Egypt needs an "inclusive democratic process" that respects the rights of all Egyptians. Except the result of that process will remove the rights of Egyptians who aren't Muslim men. So Clinton is calling for the military to allow the Muslim Brotherhood to take power in order to protect democracy and human rights by eliminating the latter. The Boston Globe has an editorial calling for US aid to be used to pressure the Egyptian military into ceding power to the Brotherhood. Under the usual high standards of journalism, the Brotherhood's name doesn't appear in the piece. Senator Leahy is pushing the same Brotherhood agenda. Not exactly a surprise. Caroline Glick has a good summary of the whole mess from its early days overlooking Tahrir Square to the present day in The Brotherhood's Useful Idiots.. The regime's decision to outlaw the parliament and decree the military above the president was not a show of strength. It was a panicked act of desperation by a regime that knows its days are numbered. So was its decision to delay announcing the winner of the presidential elections. This is the article to read if you want to understand why all the SCAF rants are empty nonsense. Liberals ranted endlessly about the Turkish military's Deep State, but the real Deep State everywhere is Islamist. The purpose of the taxes, regulations, and prohibitions is to impose the "social justice" clamored for by various social engineering groups that wish to punish, control, or extinguish other groups. Governments – federal, state and local – wish to have enough revenue to either balance their budgets, or at least stave off bigger than usual deficits, while at the same time heeding the social justice brigades' demands for smoke-free air or reduced car emissions or nutritional information on food products or a "fairer" redistribution of earned income. This compels government policymakers to seek a median, which only ratchets up costs all around. It is a no-win episode of bipolarism for everyone, two steps forward, one step back. It is disguised as "social progress" by the pronouncements of activists, politicians, and public interest groups. What it is in reality is an insidious conditioning of men so that they become inured to slavery. That's from Edward Cline's excellent essay on Statism at the Rule of Reason blog. Earlier in the roundup, I mentioned the gas tax hijacking to combat the "growing problem" of distracted drivers. Go through your local newspaper or TV newscast and see how often a "growing problem" is mentioned and how often the solution is government intervention. It's an easy topic for an article too. Among the latest "growing problems" in the news feed are a task force to combat timber theft, a national awareness campaign on sleep apnea among truck drivers and a new crackdown on ATV's in Philadelphia... headlined "A New Crackdown On A Dangerous & Growing Problem". Hypertension in kids is a growing problem. So are the dental problems of preschoolers. Also workplace obesity and prescription drug abuse. And naturally all the problems require Orwellian interventions. One way to curb the large and growing problem of prescription drug abuse in the U.S. would be requiring doctors to use databases to record and track patients' prescriptions, experts say. For example, a doctor about to write a prescription for the painkiller OxyContin could look up the patient in the database to see whether the drug had recently been prescribed by another doctor. Like all "growing problems", this is one that can be tackled with unified databases, privacy violations and other suggestions from "experts" who are always around to tackle "growing problems". Obesity at work? We've got experts for that too. And a program. WASHINGTON, June 19, 2012 /PRNewswire/ -- While many U.S. employers are addressing obesity in the workplace, there is still much progress to be made as well as a need for tools and resources, especially among small and mid-size organizations, according to a survey more than 500 employers conducted by the National Business Coalition on Health (NBCH), with support from the Centers for Disease Control and Prevention (CDC) and the National Safety Council (NSC). That's the wonderful thing about growing problems. More progress always needs to be made on addressing them and more tools always need to be deployed and more awareness campaigns. Read their reports and Orwell becomes redundant. 1984 is replaced by the banality of totalitarianism. Wellness — not obesity — is the subject. Safety and health are linked together. Information and resource guidance are needed. Rebrand obesity prevention as wellness. Provide leadership in imposing your agenda. Define obesity as a safety issue. Then direct employees what to do in order to maintain workplace wellness and safety. For those who aren't up on the terminology of the media-government complex, a "silent and growing problem" is one that hasn't been talked about enough yet. Adam Taxin has some of the cartoon responses to Fast and Furious and a video commentary on gay pride at the White House. ‎much as a dead frog’s legs will continue kicking for a while, a few remnants of Occupy cling to a fitful existence. To see what the “movement” is up to these days, check out this online diary that documents the Occupy Caravan. The Caravan is a group of nine leftists who are driving, in two minivans, from California to Philadelphia. The diary, by one James Jennison, is hilarious but sad. You can’t help feeling sorry for this ragtag band of misfits who evidently think they are making some kind of political statement. Wasn't this supposed to be Occupy Summer or something? Oh right, OWS is in the House. The White House. Also the House of Representatives. ‎House Minority Leader Nancy Pelosi, D-Calif., thinks that President Obama should unilaterally eliminate the debt ceiling, rather than negotiate with Congress to spend more money when the United States hits the debt ceiling later this year. But why stop there? Why not just have Obama decree all public debt invalid to be repayable in cupcakes? But there's another Growing Problem. ‎In his speech to the 35th session of the Islamic Commission on Economic, Cultural and Social Affairs (ICECS) at the OIC General Secretariat on Monday 18 June 2012, Ihsanoglu stated that “Islamophobia has moved to a level where it is now being exploited in electoral campaigns in Europe.” He explained that recent developments, particularly which emerged in France’s recent presidential elections, confirms the growth of ultra conservatism in Europe, taking advantage of xenophobia, especially Muslim foreigners. Oddly the OIC doesn't seem all that upset about the growth of ultra-conservatism in Egyptian elections. Funny how we don't see things coming in our future until we're in the middle of them. Death, yes. That's a given, even when it takes us by surprise. But what about the other endings or beginnings? Like with life-long friendships. Who'da thunk it? That having Barack Hussein Obama run for president would become, in my life, the slow, quiet death of my 32 year friendship. I didn't see THAT coming! Stage 6: Plead Her Belly - "It's because I'm black." Obama IS supporting the Muslim Brotherhood. He says he is. He stated, through Panetta that the US would withdraw its military aid from Egypt if the Army didn't hand the entire country over to the Muslim Brotherhood. "Stage 2: Deny the Problem - "The PRIVATE sector is doing fine"? I don't know if you read Dan Ephron's article on TDB "Fearing Public Backlash, Israeli Settlers Speak Out Against Their Own." 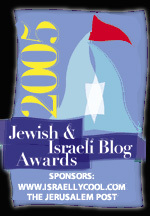 http:// www.thedailybeast.com/articles/2012/06/29/fearing-public-backlash-israeli-settlers-speak-out-against-their-own.html . (Remove spaces from link to work) More than the article the comments are what to read. Here so clearly you will see how the Israelis and Jews have lost the narrative on Israel. Very few commentors are there astutely countering the dominant anti-Israel narrative. There really should be more. If Israel is to survive, it is the narrative battle it needs to win in multiple countries. It is as important as military success. The Arabs lost the military battle but won an extremely crucial narrative battle.